Weather: a brilliantly sunny day, high 4, low -5. Ice maintenance: 9 am s/f, 12.30 light scrape only, 6 to 7 pm a good long resurfacing with both scrape and flood, and another s/f at 8.30. The ice got mushy in spots around 2, and no wonder. 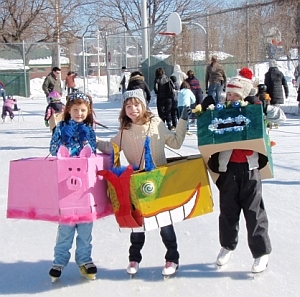 Not only was there brilliant sunshine, but David Anderson's Clay and Paper Theatre did their annual "Puppets on Ice" event, with little puppets for child skaters to wear, and three hours of hand-picked music on a sound system he had rented. David said that he had played with every one of the groups that were on the sound track. 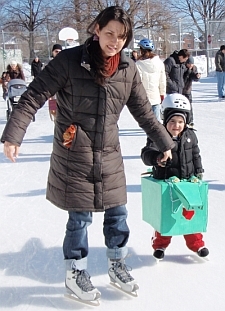 The rink was beyond crowded, but everyone seemed to be smiling, and even the mushy ice didn't draw any complaints. The lineup for skate rentals was long and therefore slow, and ditto for the lineups at the zamboni cafe. But who cares, when it's February and there's a hint that spring will return? A day like that, with music and skating and Mary Sylwester's dal soup, and mugs of hot chocolate at the campfire, just seems to work for families. 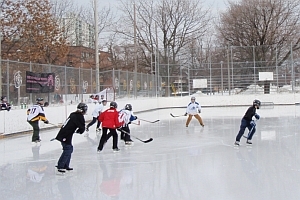 Simple, when there's a rink to skate on and there are smart, spirited city staff to run it well. Simple, and very lucky. lots of new graffiti: "fingaz"...? By 6 pm everything was back to normal. The zamboni guy spent an hour fixing the ice and then it was reopened for the shinny hockey players. Usually it's a permit but it was superbowl Sunday so not many people showed up. The Beginners' shinny group are so eager, though, that they came out in force at 9.30 and didn't lose a minute of their time. 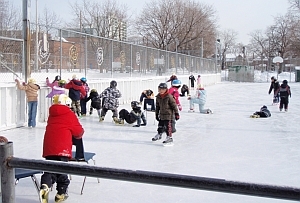 Weather: another bright sunny day, cooler, but the sun was strong anyway and the rinks was mushy against the boards. High 2, low -7. Ice maintenance: 9 am s/f, 1.30 pm s/f, 7 pm s/f, 9 pm s/f. The daytime zamboni operator is very good. He took the gamble of doing a very light scrape and then a flood at 1.30, to make sure the ice didn't get too thin, and it worked -- the ice held for the afternoon. He skipped the 3 pm flood and by 7, the ice was well set again. The rink never had to close. Weather: High minus 4, low minus 10. Snow in the morning, then sun and cloud. Ice maintenance: 9 am snow clearance -- then the zamboni broke after the hockey side was done. The mechanic came at 12.30 and fixed it more or less. Between 1.15 and 2.30 the hockey side got a scrape and flood. The snow was removed from the pleasure-skating side from 3.15 pm to 6.30 pm. At 7 pm, s/f both pads, which took a long time because the equipment froze up and the zamboni kept having to return to the garage to be washed out with hot water. At 8.50, s/f hockey side only. Weather: high minus 13, low minus 18. Sunny but really cold, ouch. Ice maintenance: 9 a.m. s/f, 10.30 flood (hockey only), 1.15 flood (hockey only), 3.30 s/f, 7.15 s/f. 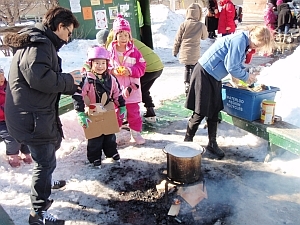 Two classes from North Etobicoke had come all the way down in a school bus. 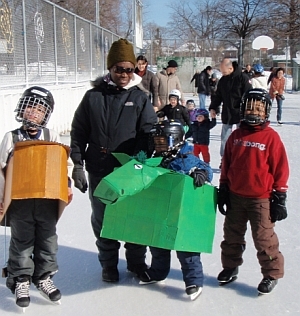 Most had never skated before, and it took a while to get them all outfitted with skates and helmets. They were troopers, and said "thank you" for any help. The teachers said they wanted to give everyone an experience of something they might not get through their families, who were mostly newcomers and mostly scraping by. The staff were so impressed with this bunch that they gave them each a hot chocolate and a park cookie, for free. 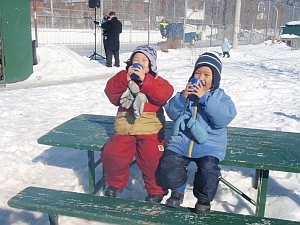 The kids had brought their lunches, and they all sat inside to eat(it was minus 15! ), the lucky ones near the woodstove. They played chess and checkers and extracted every possible feature of the rink for their enjoyment. It was so much fun to watch them, both on the ice and after. Weather: It started out at minus 16 but then gradually went up to minus 9. Ice maintenance: s&f 9am, 1pm, 4pm, 7pm, 8:55pm. One of the zamboni drivers was upset to see the Councillor's letter ordering better ice maintenance. He feels they're doing their best. Certainly it's been very impressive to see them at Dufferin --it's bitter cold, and they're out there going around and around. Since one of the operators was transferred there's a fair bit of double shifts, which must be tough on them now but will feel good when the paycheck comes, with all that time-and-a-half. There are not enough zamboni drivers, that's why there's overtime. Weather: started out at -10, then up to -2, low -6. Sunny -- the ice along the boards melted but the rest held up okay. 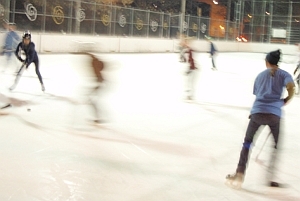 Ice maintenance: s&f 9am , 1:30, 3:30, 6:30, 9pm. 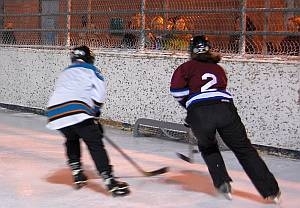 The Women of Winter shinny tournament started tonight. It was also Friday Night supper, so the competitors had to shoulder their way through a roomful of skaters/eaters/little kids to get to the half of the room reserved for them. The took it in good grace. Some of the eaters had a harder time, because it was tough to find a spot to put the plate down. People ate their gnocchi or their lamb pie or their tiramisu using the washing machine as a table, or just standing up, outside. Even so, the food at the rink is a miracle. Same with the skate rentals -- how do the staff keep it straight? But they do, and at the same time they joke with the "wild boys" at the side of the rink, threatening them with humorously dire consequences if they don't stop playing British bulldog, or don't stop calling each other "gay," as an insult. And they do stop. So far -- touch wood -- the really nasty guys haven't been around much. Weather: high of 8, no rain although it was in the forcast. The sun came out for about two hours in the early afternoon. Ice maintenance: 8;30 s/f, 11:45 s/f, 4pm water pumped off with zamboni, , 5:45 water pumped off with zamboni, 9pm s/f. 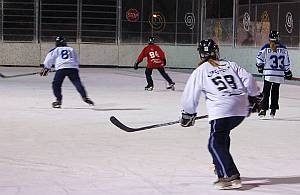 This was the second day of the "Women of Winter" shinny hockey tournament. In the afternoon the games were played in a lake, because it was warm and the sun was shining. When the zamboni operator came at 4 and took off the water, everyone cheered him. 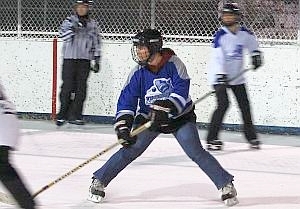 The final game was played on good ice. Weather: high of 2, low minus 7. Sunny most of the day. Ice maintenance: 9 am s/f, next resurfacing was skipped because of bright sun, plus 2 temp., ice looked good and no thin spots. 4.55 s/f, 8.05 s/f. 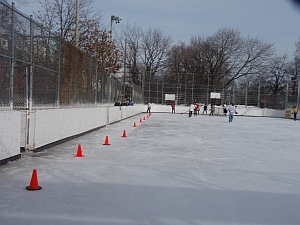 Despite the sun, the ice held, except for the sides, which needed cones. 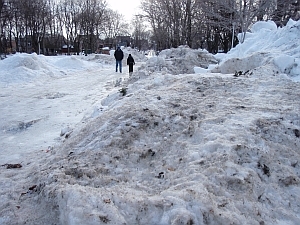 The maintenance workers pointed out that there were big piles of dirty, salty snow dumped in the park, in among the clean zamboni snow dumps. 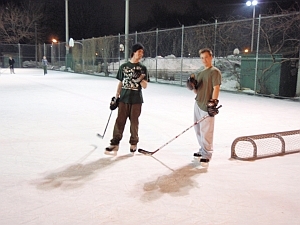 In the morning some of the salty snow to the east of the rink had melted and had begun to flow onto the hockey rink. One of the rec staff said she had noticed two big Mack trucks and a loader dumping snow at 2 a.m. about a week ago. Could be contractors with the City. A big mess! Weather: mainly sunny until late afternoon. High 2 celsius, then low of 0, then expected to rise to 10 tomorrow. 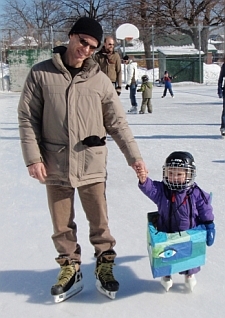 Ice maintenance: 9:45 shinny side only s&f, zamboni broke down, 12pm s$f both sides, 12.30 carpenter to fix boards will finish on tues, 3pm s&f, 7.15 s&f, 9pm s&f. Weather: cloudy but no rain. 1 degree celsius in the morning, slowly rising throughout the day until it was 9 degrees celsius at 11 pm. 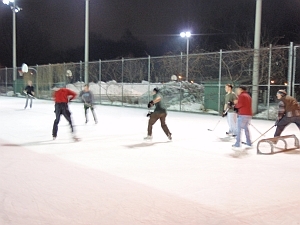 Ice maintenance: 9 am s/f, 1 pm s/f and edging, 3.15 agreed to skip, 7 pm s/f, 9 pm s/flood on hockey side only/ The ice was good, and the shinny players got to play in short sleeves. They had a really good time (women on the hockey side, men on the "pond" side), except for one woman who broke her arm, and had to leave in an ambulance. She was philosophical: "it can happen." 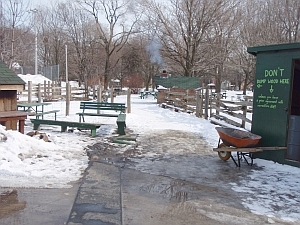 The zamboni foreperson said he heard that one of the city's road snow contractors had dumped all that dirty road snow in the park (Feb.8 entry). It sounds like they may be paid by the load, so dumping more loads has a payoff. Weather: high of 9, heavy fog in the morning than rain starting late morning. Lots of rain! Low of 4. Weather: high 4, low -6. A few tiny bits of rain, no more after one pm. Ice maintenance: no morning scrape - to let the water "thicken" so it will bond with the ice below. The foreman says it's better when skaters are skating on it so that they make groves that will fill in with the rain water (but no skaters wanted to skate on this raw morning). 12 noon: scrape. 3.30 scrape, 7pm scrape, 9pm scrape and flood of both pads. 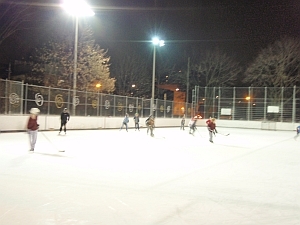 After the first scrape, the ice was lovely, but there were very few skaters until the permit and pond-hockey time (after 9 pm). It seems that most people don't really "get" that a compressor-cooled ice rink stays frozen even if it's above zero -- especially if it's all-day clouds like today. Weather: high of minus 2, low minus 10. Beautiful sunny day. Weather: cloudy with sunny breaks, high minus 1, low minus 8. Ice maintenance: s/f at 9.30am/1.30pm/5.30pm/8.55pm. Weather: Sunny, high of plus 1, low of minus 9. 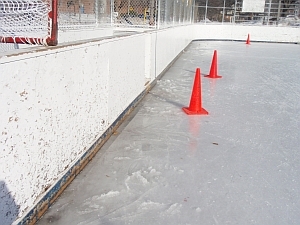 Ice maintenance: scrape and flood 9am, 1:30, 4:55, 8pm. Weather: Sunny, high of minus 1, low of minus 8. Ice maintenance: 9 am, 12 noon, 7 pm, 9 pm, all scrape and flood. But the 9 pm maintenance had two feet of ice not resurfaced because it was grainy from the afternoon sun. Very tricky for the permit -- they took the scrapers and did it again themselves, to try and fix it a bit. 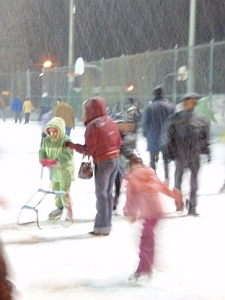 The rink was really, really crowded and lots of skaters with little kids just gave up and moved over to the snow hills. Now that most of the snow has melted away, the snow hills are still huge and dramatic for play. Weather: cloudy with sunny breaks. High -1, low -3. Ice maintenance: s/f 9 am, 12.30 pm, 3.30 pm, 7 pm, 8.55 pm. We got news that the staff are not going to be allowed to handle money anymore, so that means no zamboni cafe and no skate rentals. Nothing has happened yet, but the directive is there -- discussions coming up in the next few days. My goodness, sometimes it seems that City Hall is a crisis-making machine. They need to change their motto to "if it ain't broke, don't fix it." Weather: high 2, low -5. Wet snow off and on, sometimes changing to rain. A sloppy day. Ice maintenance: 9am, 1pm, 4pm, 6 pm, then driver went off sick, so no 9 pm maintenance for the women's shinny permit or the Beginner's shinny. Weather: high -5, low -8. Occasional bits of sun, but mostly lots of snowflurries. Ice maintenance: 9am 12pm 2.15pm 4:30pm (5.30 lots of snow, bad skating for 12 and under....waiting for zamboni driver) 7pm 8.55pm all scrapes only. Weather: sun and cloud, high minus 6, low minus 12. Nasty sharp wind. Not many people at the rink until evening. Ice maintenance: 9am /12noon / 2pm/ 5pm/ 7pm/ 9pm. All scrape and flood. Weather: High minus 1, low minus 11. Overcast and threatening snow until 4 pm when it did snow, about 5 cm. In the evening it was "Bikes on Ice." The late-afternoon snow had stopped by 9 pm when the races began. It resumed at about 10.45 just in time for the final race. 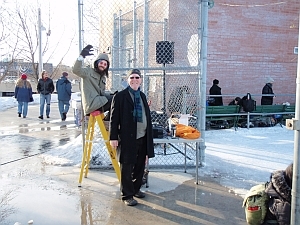 There were more spectators than in any of the years before, and they were certainly enthusiastic. A very friendly event. 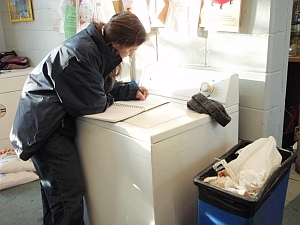 Ice maintenance: 9 am s/f, 1.30 pm s/f, 5 pm and 7 pm scrape only (snowing), 9 pm scrape only. Weather: High minus 1, low minus 11. Cloud and sun, with a few flurries. Lots of skaters out, but not as many as earlier in the season. This is the time when lots of people get winter fatigue. Ice maintenance: 9 am s/f, 12.25 scrape only, 5 pm s/f, 8 pm s/flood. Weather: sunny, minus 9 this morning, to go up to minus 6, then down to minus 13 tonight. Blowing snow, but clean and glittery. 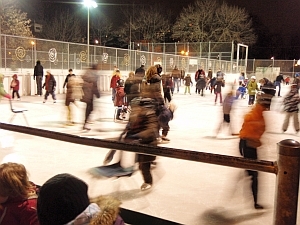 An email inquiry came from the municipality of Halifax: "I am trying to find out how may days the rinks are open and how many days they are closed due to the weather during the skating season." 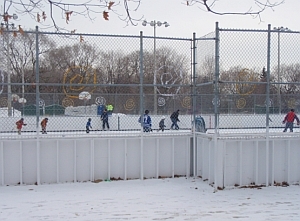 Counting: the rink was able to be open for skating for 80 days counting today. It had to stay closed 1/4 day in November, 4 and 1/2 days in December, 3/4 of a day in January, and 1 day in February. So 6 1/2 days closed altogether (adding up parts of days). Pretty good, considering that there's been a lot of weather this winter. Ice maintenance: 9 am, 1 pm, 3.30 pm, 7 pm, 9 pm. All scrape and flood. Weather: high -3, low -15. Sunny. Ice maintenance: 8am, 12.30, 3.15, 7pm, 8.55pm s&f all. Weather: high plus 2, low minus 7. Mainly cloudy with some sun. In the afternoon everything was melting along the boards and the paths were muddy. Then in the evening the ice set up nicely. 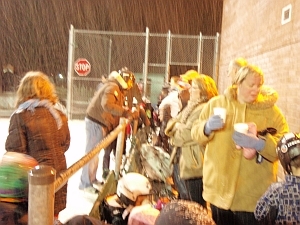 A lot of people came over from Regal Road School for their "family skate night." One of the parents had arranged for free hot chocolate, so that was flying out the cafe window. 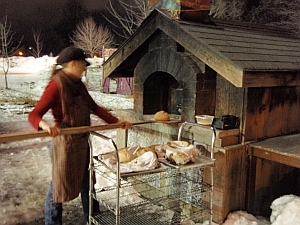 meantime outside Jenny was baking the Wednesday night sourdough in preparation for the market. People were remarking on what a perfect night it was, so mild and sweet, when all of a sudden it began to snow, and it didn't stop until after everyone left (actually, much later it turned to rain). By 8:45 all the families had gone, and the women's shinny permit began to arrive. But no sign of the zamboni driver. He didn't show up until a few minutes after 9, and by then there was so much snow on the ice that it took him until 9:30 to get it off. The shinny players were pretty mad, since they all knew he ought to have started earlier. They stood at the fence and watched. Then they had only half an hour left to play. They said they didn't mind playing in a bit of snow (it was still coming down), but that they did mind him coming late again. I guess it happened to them several times before. Ice maintenance: 9.30am/1.30pm slush 4 feet from boards not touched. 3 pm maintenance skipped (with consultation) -- too slushy and soft for Zamboni wheels. 7pm scrape and flood not using brush on the hockey side just blade, also on pleasure side, 9.10 scrape both sides. Weather: High 6, cloudy with very brief sunny periods, low 0. Rain started about 10.30 pm. 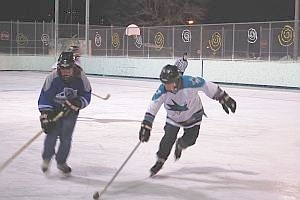 Ice maintenance: 9am - zamboni in circulation for flying squad, because their zamboni is still down - 3pm flood hockey, scrape pleasure (zamboni very low on gas because it was used for the flying squad) - 7pm s&f both sides, 9pm s&f both sides. Weather: rain in the morning, 9 degrees, then the temperature fell quickly starting around 12.30, no more rain. Low in the evening -16. Ice maintenance: Dufferin 9am, 1pm, both times scrape to remove water. 3pm, 7pm, 9pm all three times s&f. Ice maintenance: 8am s/f, 1 pm s/f, 5.30 pm s/f, 8.55 pm s/f.